Neurogenic shock is a distributive type of shock resulting in low blood pressure, occasionally with a slowed heart rate, that is attributed to the disruption of the autonomic pathways within the spinal cord. It can occur after damage to the central nervous system, such as spinal cord injury and traumatic brain injury. Low blood pressure occurs due to decreased systemic vascular resistance as a result of lacking sympathetic tone which in turn causes pools of blood staying within the extremities and not being redirected to the core body. The slowed heart rate results from unopposed vagal tone activity and has been found to be exacerbated by hypoxia and endobronchial suction[clarify]. Neurogenic shock can be a potentially devastating complication, leading to organ dysfunction and death if not promptly recognized and treated. It is not to be confused with spinal shock, which is not circulatory in nature. Warm, flushed skin due to vasodilation and inability to constrict blood vessels. If the injury is below C5, the patient will exhibit diaphragmatic breathing due to loss of nervous control of the intercostal muscles (which are required for thoracic breathing). If the injury is above C3, the patient will go into respiratory arrest immediately following the injury, due to loss of nervous control of the diaphragm. Neurogenic shock can result from severe central nervous system damage (brain injury, cervical or high thoracic spinal cord). In more simple terms: the trauma causes a sudden loss of background sympathetic stimulation to the blood vessels. This causes them to relax (vasodilation) resulting in a sudden decrease in blood pressure (secondary to a decrease in peripheral vascular resistance). Neurogenic shock results from damage to the spinal cord above the level of the 6th thoracic vertebra. It is found in about half of people who suffer spinal cord injury within the first 24 hours, and usually doesn't go away for one to three weeks. Because it causes a loss of sympathetic tone, which plays a major role in other forms of shock, neurogenic shock causes a unique and atypical presentation. Typically, in other forms of shock, the sympathetic nervous system triggers various compensatory mechanisms by releasing epinephrine and norepinephrine, its major chemical mediators. These neurotransmitters trigger an increased heart rate, faster breathing, and sweating. They also trigger vasoconstriction, to shunt blood away from the extremities and to the vital organs. Neurogenic shock is diagnosed based on a person's symptoms and blood pressure levels. Symptoms of neurogenic shock include sweaty, cool skin; labored breathing, low blood pressure; dizziness; and anxiety. Many people with neurogenic shock have suffered an injury to the nervous system, such as the spinal cord. Dopamine (Intropin) is often used either alone or in combination with other inotropic agents. Certain vasopressors (ephedrine, norepinephrine). Phenylephrine may be used as a first line treatment, or secondarily in people who do not respond adequately to dopamine. Atropine is administered for slowed heart rate. ^ J.M. Piepmeyer, K.B. Lehmann and J.G. Lane, Cardiovascular instability following acute cervical spine trauma, Cent Nerv Syst Trauma 2 (1985), pp. 153–159. ^ "Dorlands Medical Dictionary:neurogenic shock". ^ a b Newman, Mark F.; Fleisher, Lee A.; Fink, Mitchell P. (2008). Perioperative Medicine: Managing for Outcome. Elsevier Health Sciences. p. 348. ISBN 1-4160-2456-5. ^ a b Mallek JT; Inaba K; et al. (2012). "The Incidence of Neurogenic Shock after Spinal Cord Injury in Patients Admitted to a High-Volume Level I Trauma Center". The American Surgeon. 78 (5): 623–626. ^ Axelrad A, Pandya P, et al. (2013). "The Significance of Neurogenic Shock and Acute Spinal Cord Injury (Poster Session)". Critical Care Medicine. The Society of Critical Care Medicine and Lippincott Williams & Wilkins. doi:10.1097/01.ccm.0000439365.59627.b5. ^ Holtz, Anders; Levi, Richard (6 July 2010). 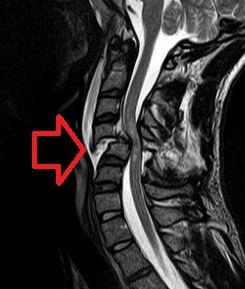 Spinal Cord Injury. Oxford University Press. p. 63–4. ISBN 978-0-19-970681-5.